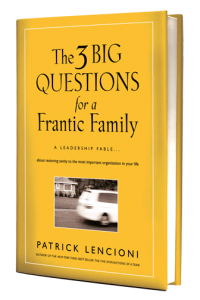 Welcome back to Life Compass, where we’re talking about Patrick Lencioni’s new book, entitled: The Three Big Questions for a Frantic Family: A Leadership Fable About Restoring Sanity to the Most Important Organization in Your Life. In my last post we covered Question #1: “What makes your family unique?”. In this post I’ll cover Question #2: What is your family’s top priority rallying cry right now? How often have you come to the end of a week, month, season or year and you felt frustrated that you didn’t accomplish some of your most important goals? It’s not that you weren’t busy during that period…you were just busy doing a lot of other things. Lencioni suggests that families can eliminate this frustration by knowing what issue or goal sits at the top of their list of priorities in the current time period (he suggests a time frame of two to six months). Without a top priority, or rallying cry, everything seems equally important and we spread our time and energy across too many worthy but impossible challenges. At the end of the day (or the week, month or year) we are often left disappointed that the biggest things didn’t get accomplished. How do you determine your family’s rallying cry? Lencioni says you need to ask “what is it that we must accomplish by the end of this year (or whatever period) in order to say that it was a productive time for our family?” Answers will vary greatly from family to family, and from period to period. For instance, one family’s rallying cry might be to help dad through a difficult career change, while the family next door might be focused on the discipline of their twin boys. And that same family might decide that their top priority a few months later is to spend more time together as a family, while the neighbors’ might be to cut expenses. I think it is important to remember here that there is no good or bad answer, or right and wrong answer. It’s just about figuring out what matters most to your family. And once that’s done, you have to identify the four or five big things that need to happen in order for the top priority to be accomplished. Going back to the previous example, in order to help dad through the career change, the family will need to ensure that dad gives up some of his volunteer activities at school for a few months, that the family cuts back on some expenses that are creating financial pressure, that dad enlists the help of a career counselor and that mom and dad have a weekly date to discuss options and progress. And while this might seem like a goal for the dad alone, it is something that everyone in the family needs to find a way in which to contribute because it affects the entire family. After all, it’s the rallying cry for the family, and nothing else is more important. Is your family stuck in survival mode? 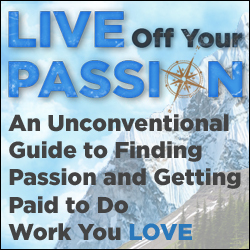 Give Lencioni’s suggestions here a try and let me know how it goes. I believe your family can not only survive, but thrive.